Each sip a battle, each taste a conquest. 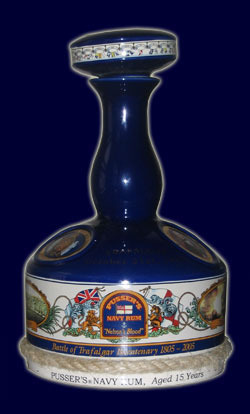 Pusser’s Battle of Trafalgar rum is a rare treat. Getting a bottle now would surely be costly, as I believe it was a limited rum. But if you somehow manage to score one it would be well worth the effort. Not only is the bottle sublime (a porcelain decantar featuring paintings of Nelson’s career, and even a rope around the base spun by the exact machines that made the ropes for Nelson’s own ship), but the rum inside is remarkable. To the nose it is deep, peppery, and cool. To the palate it is similar, but with an extra emphasis on the peppery. This rum has bite, and it ain’t shy. A novice may well find it brutal, as might a rum drinker of more experience. But if you want a rum that commands notice, this is it. This entry was posted in Rum and tagged dark rum, pusser's by Bilgemunky. Bookmark the permalink.